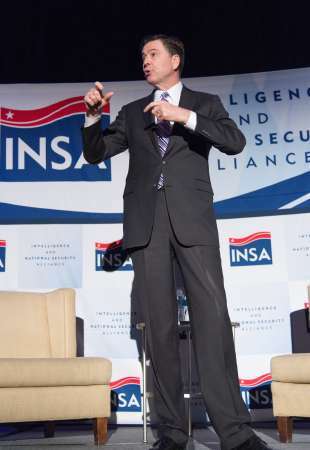 INSA Leadership Dinner with FBI Director James B. Comey, Jr. on March 29, 2017. The changes are in line with experiments already underway at the Defense Department and the NSA—encouraging agents to spend time working in the private sector, bringing in private sector experts to perform tours of duty inside the bureau, and potentially building an internal university to develop the future cyber talent the FBI needs now and in the future. INSA Leadership Dinner with FBI Director James B. Comey Jr. on March 29, 2017. With six years left in his tenure as FBI director, Comey has already kick-started a transformation effort that firmly embraces the digital changes swirling through the ranks of what is arguably one of the government’s most insular cultures. First and foremost among those transformation efforts is the way in which the bureau assigns cases. The modern digital age has completely obliterated the traditional concept of assigning cases to the nearest FBI field office. The physical manifestation of a crime or terrorist event “isn’t all that meaningful” in the age of the Internet and nation-state sponsored cyber espionage. “We now assign computer intrusion work, whether that’s a nation-state, whether it involves a criminal syndicate, whether it involves a criminal syndicate working for a nation-state, whether it involves hacktivists or somebody else—sort of the motley crew of people engaged in intrusions—we assign it based on talent,” Comey said. But the FBI “is not blind to physical manifestation” when it comes to criminal investigations, said Comey. Although the bureau assigns the threat to the appropriate talent, up to four other field offices are often enlisted to play supporting roles. One such office is known as a Strat office (for strategic) and the other type of office is referred to as a Tac office (for tactical). From a recruiting standpoint, the bureau may also need to open its mind to FBI agents who don’t carry weapons. Comey acknowledged the challenges the bureau faces when it searches the cyber talent pool for individuals who not only present specialized technical talent but must also be physically fit enough to “run, fight, and shoot” and be a person of high integrity. “That collection of attributes is rare in nature,” Comey said. “So we stare at the pool of talent and we have two reactions to the pool. We can’t compete on money. You in the private sector have more money. We acknowledge that to the people we are trying to recruit. But then we also make sure that they understand life with you is soulless and empty,” he said, to lots of laughter.